Suryaa Villa is located in Jaipur, a short ride away from the Pink City. It features a restaurant and a small outdoor pool. Free Wi-Fi is available throughout the hotel. The air-conditioned rooms combine wooden furnishings with modern amenities. Each room has a seating area, a flat-screen TV, and a minibar. The private bathroom offers a hot shower. 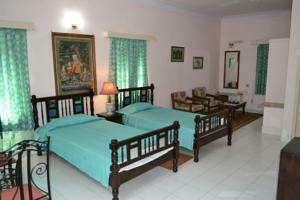 Suryaa Villa is about 7 km from the airport, and 3 km from the Jaipur City Palace and Hawa Mahal. Free pick-up service is provided from Jaipur Railway Station and the Central Bus Stand. Guests can arrange travel excursions at the concierge desk. The 24-hour reception provides car rental, currency exchange, and laundry services. Situated by the pool and lounge, the restaurant serves international dishes. Guests can also order room service. Free! All children under 7 years stay free of charge when using existing beds. One child under 2 years is charged INR 700 per night and person in a child's cot/crib. One older child or adult is charged INR 1000 per night and person in an extra bed. Maximum capacity of extra beds/children's cots in a room is 1. Supplements will not be calculated automatically in the total costs and have to be paid separately in the hotel.